It's that time of year again... leaves are changing colour, days are getting colder, and we start to cozy up our homes for fall. 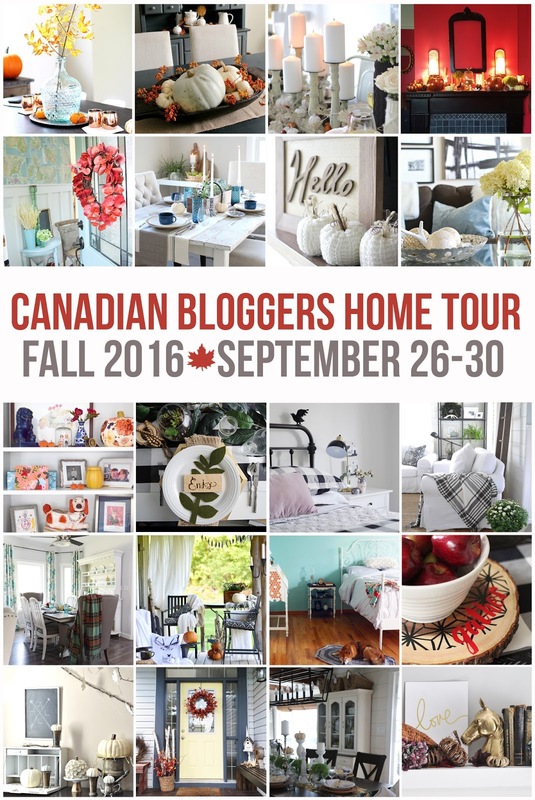 This week, I'm joining 19 other bloggers as part of the Canadian Blogger Fall Home Tour hosted by Christina of The DIY Mommy. Hope you enjoy my tour and visit the others at the end of this post! 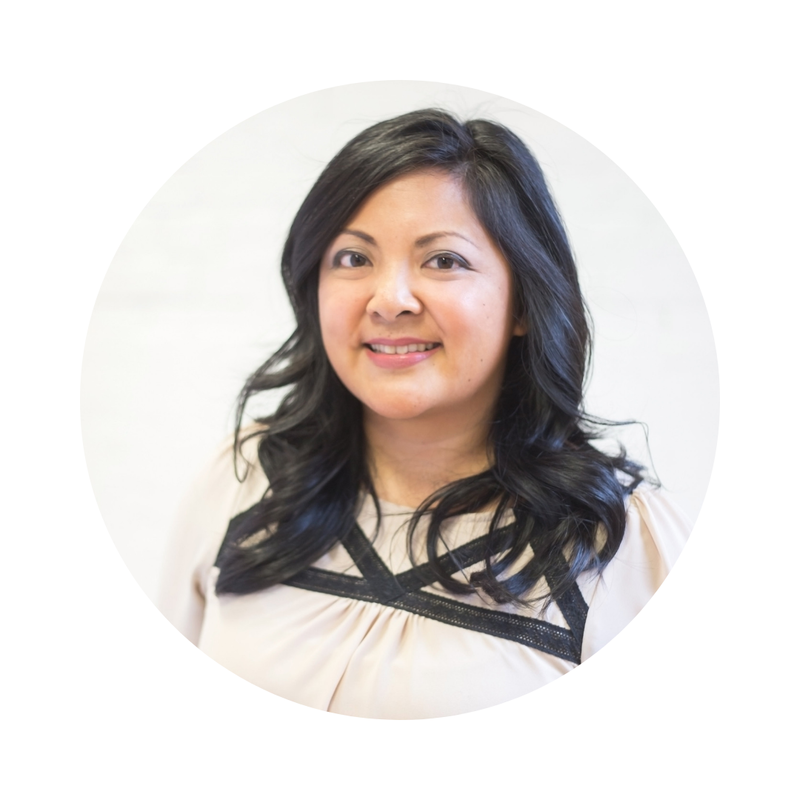 If you're visiting here for the first time, we live in a typical Toronto home that we've renovated from top to bottom and infused with transitional style. 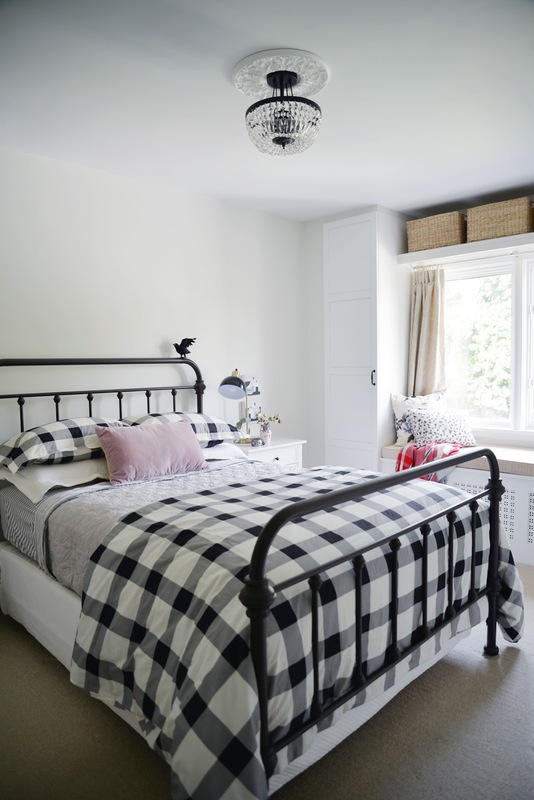 It's a never-ending process and this room has evolved from a dingy blue room lacking in storage to a nursery then big girl room and finally this guest bedroom. We're lucky enough to get four distinct seasons here in Toronto. But while I love chunky sweaters, apple cider, and all the trappings of the season, I don't go all out with my fall decor. I find fall quickly transitions into winter and I'm not one for decorating with reds and oranges and browns, so for me, this time of year is more about simple changes and easing into a cozier state of mind. We finished redecorating this room not too long ago but it needed an update. I had moved the spool nightstands to our cottage so it was a good time to bring in a few new accessories as well. 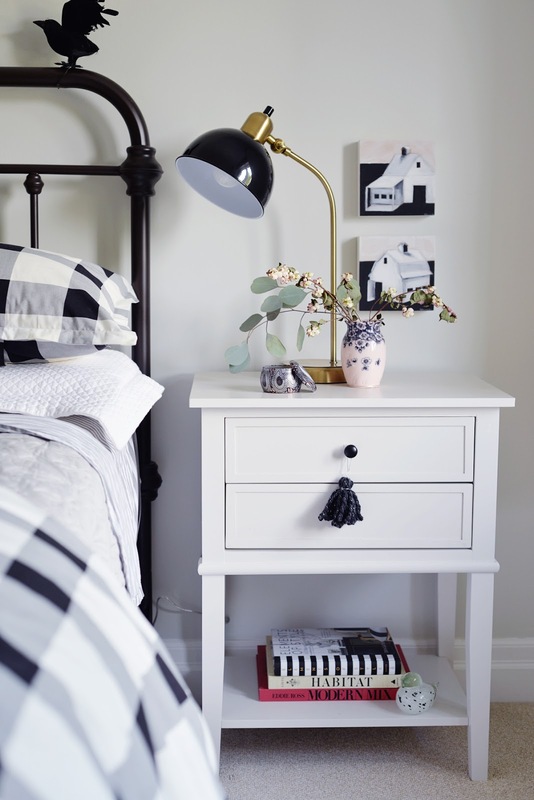 For the nightstand, I shopped on one of my favourite sites, Wayfair. As a Canadian, I appreciate that their .ca site lists prices in Canadian dollars and includes shipping and duties. No surprises when the UPS guy shows up! I picked out the Franklin 2 drawer end table in White. Assembly was super easy (it took me less than 1/2 hour) and the piece is stable and sturdy. It needed a little 'something' so I made this tassel with chunky yarn I had lying around. I used this easy DIY tassel tutorial. To coordinate with the rest of the furniture, I also spray painted the knobs black. I finding selecting art to be a challenge but these pieces really spoke to my heart. 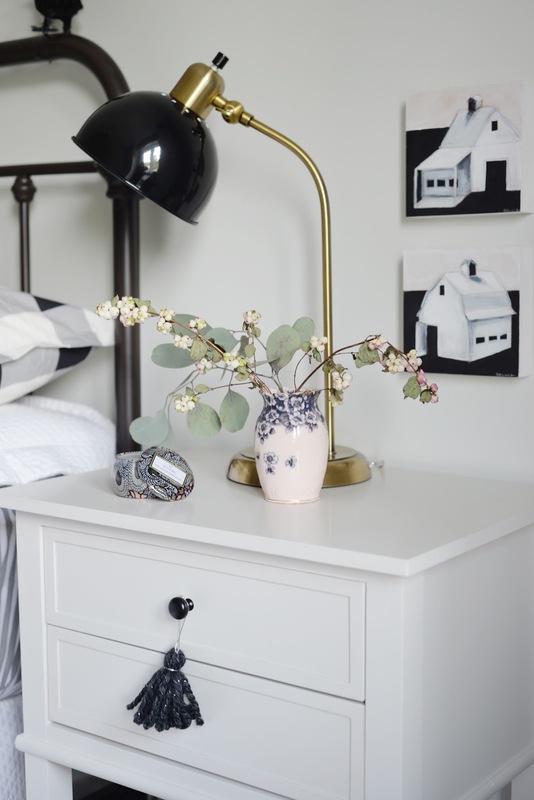 Eventually, they'll be moved to the cottage but for now, they work great in this room and complement the farmhouse style bedframe. The art is by ModernCabinbyEW on etsy. 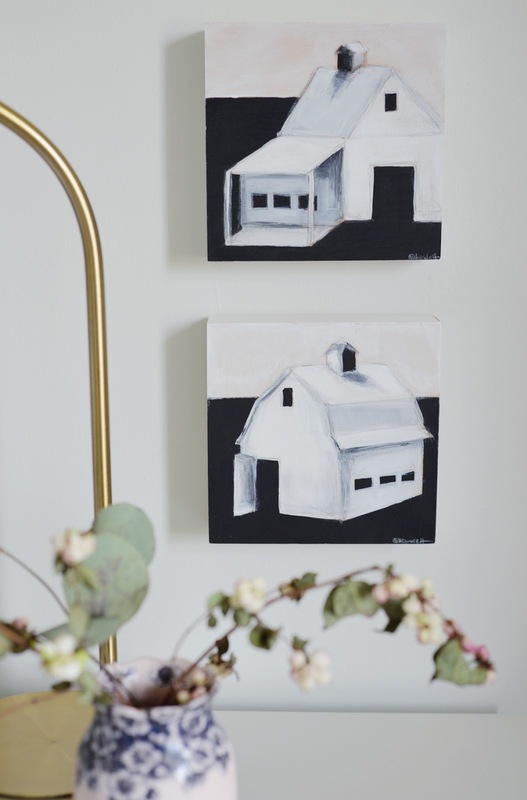 She has a fabulous collection of modern barn paintings. I love the delicate pink hues of this pair. 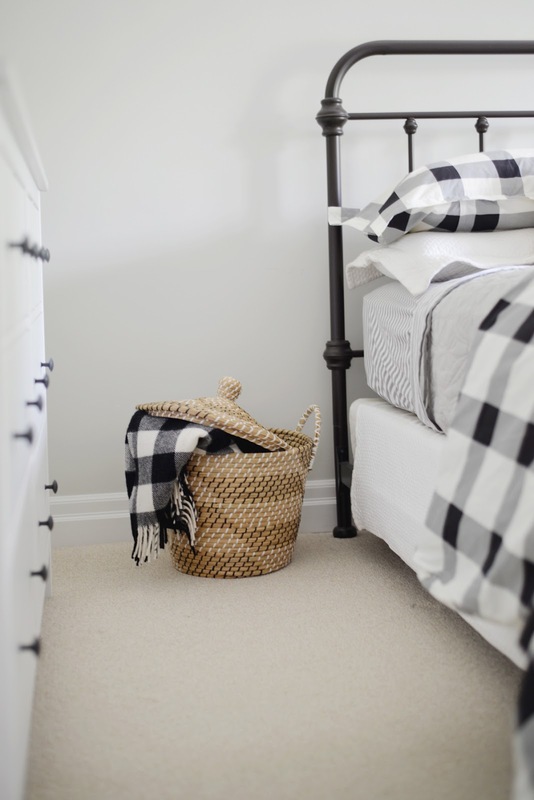 You can warm up your bedroom for fall by piling on the textiles. 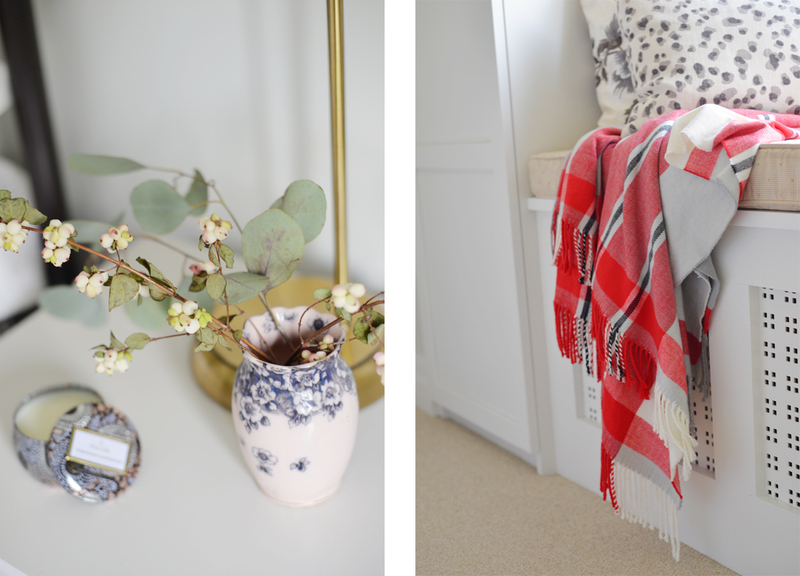 I pulled out my red blanket from Indigo (they always have the softest and prettiest throws!) 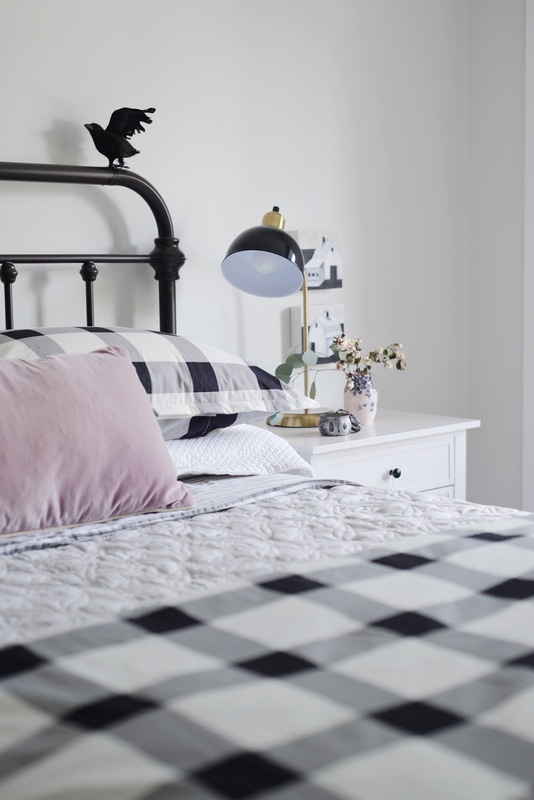 for the bench, and layered the bed with a check duvet and shams from Simons. Buffalo plaid, oversized gingham... check patterns will always be my favourites! 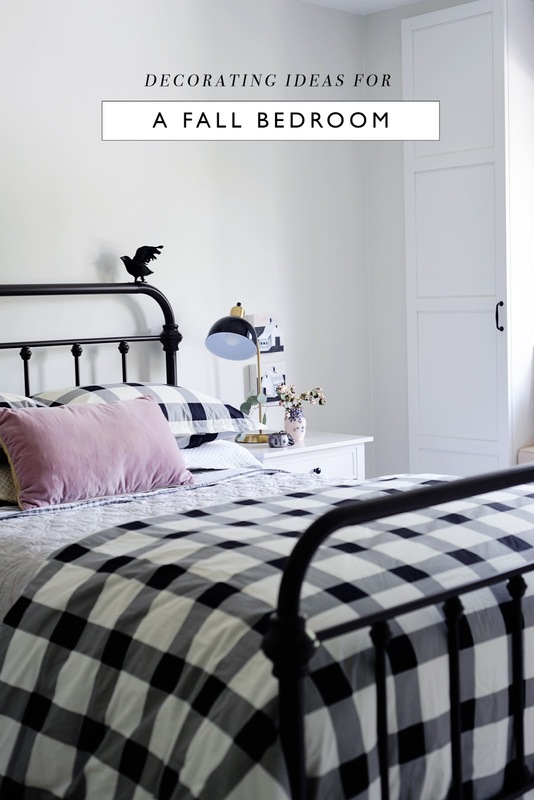 On the other side of the room, I displayed a few rustic accessories on top of the dresser. The shadow box from Indigo and the topiaries from Real Canadian Superstore were both bought on clearance in the spring but the rest of the items I've had for years and just keep moving about the house. The golden textures make me think of wheat fields and add warmth to the black and white scheme. You can never have enough warm blankets at this time of year. This lidded basket was also a new addition. It's from Canadian Tire (I know! So unexpected) and is just as durable and stylish as pricier versions I've seen. 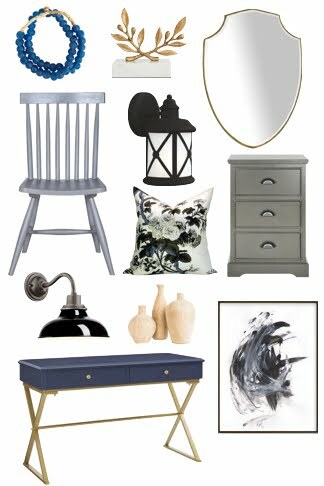 Small changes were all I needed to take this bedroom from summer to fall. I hope you enjoyed my tour! For more fall decorating inspiration, visit the rest of the participants' home tours on their tour dates below.